BRAZENLILLY: ... and the not so good. ... and the not so good. I want to respect their privacy, so I won't go into huge detail, but I want to share a bit for 2 reasons. First, I'd love your prayers. For me, for my husband, for our kids, for our relationship with them, for our transition to a family of 5, and our separation for 2 weeks. But the second reason is I think that there's a tendency to have an "online reality" that isn't true to the "real life reality." I get a little bitter when bloggers (or just FB friends) always paint this amazing portrait of their happy lives--cute things their kids did, little date night ideas, how much they LOVE being a mommy every second of every day and oh by the way did you see how my kids and I remodeled our huge playroom using only recycled materials and chalkboard paint while I was churning my own butter and jarring my organically grown green beans while the children recited Psalm 119 from memory and checked off their extensive and meticulously updated chore chart?!?! Clearly it gets to me. I want you to know that I do LOVE being a mother, and I adore my kids, but we're having a hard time, darn it! Carson has always had a strong will (understatement) and a temper. But in the past few months he's really struggling with keeping the anger at bay. (also understatement) I'M struggling with how best to deal with that in a loving way and not cry myself to sleep each night. Trent and I have prayed about it and decided that Carson and I should talk with a family counselor. I share that, too, b/c I wish there wasn't a stigma around seeking help from a professional. I just want him to have the opportunity to talk about how he's feeling--about the upcoming transitions? about life? about being the oldest? about his angry triggers? about his mean mom? I don't care. I just want to HELP HIM. And also? Help me. I'll be meeting with the counselor as well. Much of the time he's himself: funny, smart, loving, snuggly, witty, creative, kind. Did I mention funny? But when the underbelly is showing up as much as it has been lately, we want to work on that. Especially if it has anything to do with bringing a new little bro home, who will have his own emotional baggage to deal with. Sydney is having her own issues. She has always been a mama's girl. A little clingy, kind of needy. But she's so stinkin' cute and sweet that it's not that big of a deal! Of course I'll drop everything and snuggle on the couch! But lately, a 20 minute snuggle time is not enough. It just doesn't recharge her batteries like it used to. She has to be with me--TOUCHING ME--throughout the day. Dad doesn't cut it, even though he's tried. I've literally stepped on her feet about a dozen times in the last week, b/c she follows me like a shadow, keeping one hand on my leg. Yesterday she was bawling, WEEPING and screaming when it was quiet time--she has to be in her room by herself. Which we do every.single.day. We had already had snuggle time and she still wanted me to be with her. She was so distressed that she almost gagged herself into a vomit because her crying was so hysterical. I'm not the professional, but I have to wonder/assume that this clinginess is in response to the talk about a new bro, knowing Mom & Dad are going to leave for a long time, and her older brother's aggressive behavior. Ugh. Issues with my kids send me over the edge more than anything else in my life. Not only does it completely drain me emotionally, but this is what I consider to be the most important job of my life, and when they are acting messed up it makes me feel like I've messed up. I've received great encouragement from friends and wonderful support (and relief) from Trent and the grandparents, and I don't feel like this is hopeless, that this season will last, or that Asher's joining a jacked-up family. :) On the contrary, I'm really looking forward to just getting home and getting down to business--figure this new normal of being 5 instead of 4, instead of the long, LONG anticipation for all of us. Of course, that anticipation is also an emotional roller coaster! The other day I read on Mama K's blog about the day they got custody of their daughter. The day she came to their hotel with all her earthly possessions. The social worker said little S had not slept well the night before, because she knew what was coming. Yeah. NO KIDDING. I can't even type that sentence without crying. And when I think about the night this comes for Asher, I breakdown every time. I know in my head that we are doing the right thing, and that time after time these toddlers heal from the trauma, but I cannot in my earthly mind comprehend what that would be like for a child to be told by their "mom" (even if it is a foster mom--they don't know the difference) that tomorrow I'm giving you to those strangers you met yesterday and you will never come back here. This is the last night you will ever sleep next to me. It causes me physical pain to even imagine how our son will be feeling. How will we even begin to help him through that? How will I keep myself together emotionally and not be on the ground in the fetal, crying with him? Maybe if I cry for the next 44 days I'll have it out of my system. Probably not. Sorry this post is a Debbie Downer. But I've been pretty quiet on the blog for a while, and now you know why. If you can't say something nice....just wait and write a really long and depressing post a few weeks later. :) Thank you all for your encouragement and support. It really, TRULY helps and uplifts. We've started our packing list (fun!) and cherishing good days and hours with our older kids. We have a few special outings planned before we leave. They are very excited about Asher, picking out clothes and toys for him, talking about where he's going to sit at the table and on the couch when we have movie night. Deciding which swing on the set will be "his." I know we're gonna get through this. In a moment of perfect timing, this week I am studying "ENOUGH" in my Bible study. Talking about all the ways we feel we do not have enough, and how God provides. This week is not about enough money or possessions, it is about not having enough patience, wisdom, time, energy, strength. I have to, HAVE TO trust that He will fill in the gap where I feel I am lacking. I'm clinging to some well-known verses that have new light for me. I guess this post is me "boasting" in my weakness. I'm so glad that God can work, even in weakness. Because we're all going to need some gap-filling: all 5 of us. ah, so refreshing. my son eats dog hair dust bunnies he finds on the floor. my daughter only wears footsy pajamas and goes into hysterics when she must wear clothes (which is rare- she goes to the store with me in her jammies). Does that help a bit? It helped me ;) good job momma- thanks for keeping it real! Well said Jen. Well said. I'm sorry your kids are giving you a hard time. It's NOT easy! Add on top of it all, YOUR emotions and fears and you've got yourself one emotionally fragile family! It does seem to be a common theme among adoptive families. So many times friends have reached out for prayer because their kid, a few weeks before they travel, all of a sudden stops sleeping at night... or now freaks out when they leave... or is getting trouble in school. I could go on... While our children are pretty resilient, I think there is a whole lot of confusion and fear and they don't know how to express it and probably don't even know they are feeling it. How could they? They are just kids! We try our best to prepare them - but if so many adults don't "get it" I would imagine it's hard for kids to wrap their heads around it. Adoption is close to the heart of God which means the Devil is going to do his best to attack you. How smart he is to use your kids against you! Sneaky Devil! Thank you for sharing, Jen. Thank you for opening your heart up and letting us see this journey that your on. Man, its hard being a mother, let alone a mother going through such an emotional rollercoaster ride. I admire you so much and I think (in my humble opinion) that you're doing an amazing job. For what its worth, I think its great that you're going to see a counselor with Carson. Communication is so important, and to have the chance to teach him that now will serve you both really well in your relationship with each other and with others in the future. And it does sound like Syd is trying to say "hey, I'm a little unsure here" with her need for Mama Time. But it also sounds like you're setting her on the right path by letting her know that yes, you DO have time for her, but at the same time gently showing her that hey, you also have time for others and its okay to share your Mama, because hey! she'll still be there to cuddle you later. But hoo-boy, I bet its hard when you're dealing with it all right now. Hugs, lady, because I bet you need some. And finally, in my long-winded and rambling note, let me just thank you again for showing the hard times, because I agree with you - there's just to much "I'm perfect, why aren't you perfect too?" going on out there. Parents need to know that its hard. Its really, really hard some days. Its go to bed crying hard some days. But we wake up, we try again, we try very hard NOT to beat ourselves up and we give it our best. And it seems to me that you're doing your best, Jen. And I think we all love you that much more because of it. As Monica once said to Rachel, "You go girl! Michelle took the words right out of my mouth. Refreshing. I've just spent 4 days flying solo and battling a 3 year old who decided to (not once, but TWICE) cut her hair off and all of her sisters' barbie's hair and then laugh in my face about it. Saweet. So, as far as the tough mama stuff with kid I am giving a nod in your direction even though I'm not going through exactly the same thing. I get you. I get your heart. 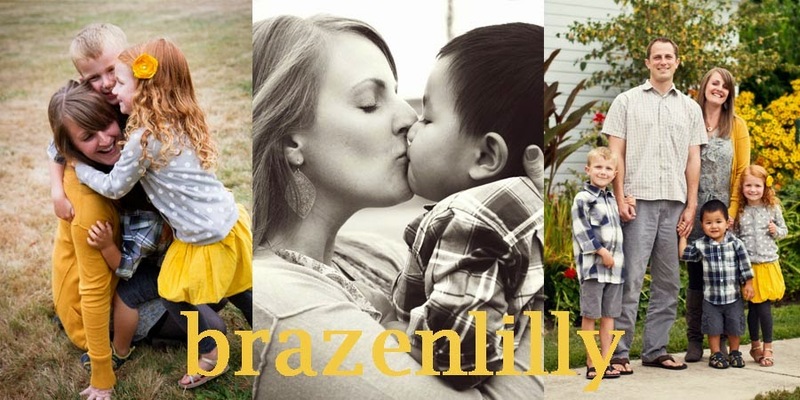 I am so glad you are blogging about this transition time with adoption because honestly (even though we are WAY earlier in the process) I feel it. The closer you get to bringing your child home the closer you get to the pain that brought them to you. There is NO way around it. I think it is natural, normal, and healthy to feel all of those things and even though the stuff you're going through with your kids in preparation is tougher than a mudder, I truly believe two things 1) God will use it to bring you closer to each other even when you are lying on the floor in the fetal position with your kids bawling your eyes out. (Been there, done that and God worked in it.) 2) The enemy of our souls also works over time to discourage, exhaust, distract, and strike fear in our hearts when we're about ready to move into the "new" that God has for us. I have been praying for little Asher's heart. I get a lump in my throat when I look at my own children and try to imagine what adopted children go through as they transition. So, so hard. So, so raw. Even though we've all been focusing on the celebration we are SO there for you (even if it's via the blog!) and your blogging about the bad on the blog is actually beautiful. God is using it. And one day you WILL look back and see all the healing, all the transformation. You're gonna make it sister. Sorry for the novel, but you put words to my life right now. Love you. There is no reality on the internet! But lucky for us it provides a place to chronicle our experiences. I'm a big believer in living all parts of your life, and sharing not only the happy, exciting ones but the complex and heart-wrenching ones too. It sounds to me like your children are probably reacting to the upcoming transition with coping behaviors. Perhaps they are preparing for the huge changes in your family and will calm down after you return. A counselor is a great resource and screw the stigma! I know you feel the grief of the son you've never met. And although it seems weighty and unsurmountable, he will know that his foster family loved him. This is key. He will be at an age where he can partially comprehend what is happening and ultimately he will heal and learn to love you. I say this to you because I have seen it first hand, and I am starting to see the heart of a little boy who is beginning to love and trust us. Don't lose hope. Feel the grief but don't let it engulf you. When the time comes, you will be stronger than you think. I see your heart in this post. It is beautiful and painful and real. I've never been at the point you've described before, but I'm here in the blogosphere weathering the storm with every word I read. Don't forget that God is leading your steps, and though hardships may come He is and has orchestrated your path. He has never failed you yet. You and your family are in my prayers. Oh my dear friend, thank you for letting us in and helping us know how to pray for you. I must say, I am so glad you shared your heart because you are NOT alone. Parenting is hard work. There are so many times we feel ill prepared, out of our minds, drained, exhausted and discouraged. I am praying you are able to feel and know God's peace, strength, acceptance and love in who you are and how you parent your children. You are all on my heart so much. I am sorry for the hard times you are going through with Carson and Sydney. I am sure the upcoming transition is affecting all of you. It can be so hard to figure out what is going on in those little heads. I think it is wonderful to talk with someone who can help you. There is NOTHING wrong with getting help and learning how to interact with each other. I will pray for Syd's heart as well. No really, if it makes you feel any better, my little kids are seriously turning my blond hair gray and that is quite a feat because it's really hard to tell if blond hair goes gray. Chase was kicked out of preschool because of his crying issues, Lane (like Syd) won't leave me alone at all which means if she is awake she is next to me. Oh look, here she is, right next tome right now as I type this. Wonder why I am always gardening and sewing? BECAUSE IT DROWNS THEM OUT (and it drowns out the little crazy noises in my head). I'm a big fan of keeping it real, and I love that you kept it real in this post! Honesty is healing and I much prefer the real joy that waits on the other side of the gut wrenching ugly truth then the fake make-you-feel-good gum drop and pony land. :) Adoption is so hard on the kids isn't!?! Your level of understand and empathy will give you so much strength to walk through the transition with Asher. I can relate to this post is sooooooo many ways. God did not give me easy kids and I often questioned if I was good enough to adopt because I couldn't even keep my cool with my biological kids. But broken kids don't need perfect families, they need real ones. Real ones who are willing to look at the truth and seek help and understand the heart behind all the really difficult behaviors from all the kids. And YOU ARE THAT FAMILY. God in his great wisdom chose to use the Thomkins family to put the fatherless in a family. And at least from my experience, you won't do it perfect, but somehow it can be an INCREDIBLY refining and soul healing processes. I like you struggled a TON with not reacting in love and kindness to my kids tough behaviors. Lots of really bad parenting moments. And I've had some of those with the twins, but today, and the past few months, there is this new peace in my soul and seeming patience without end. I hardly recognize this quality in myself, it is the LORD at work in me. I've gone through more pain then I ever have before to get there. It's really hurt to grow (understatement), but seeing God's work in my life and the good he has brought in me is priceless. Be encouraged friend! Our hearts need the trial of adoption as much as our kids need homes. You paragraph about Asher is so real and true. You are seeing the trauma early and that's so important! We sort of anticipated it with Little Man but his grief and trauma from a simple separation were heart-wrenching. We're still working through it with him. It's difficult to go there, to imagine how hard it will be on him, but it is so necessary to keep yourself from marginalizing his pain. Prayers for all of you!!! Jen, I feel like we should have had coffee while I was in Salem. You are balancing a lot of your own emotion right alongside your little ones... which seems impossible some days, I'm sure. Hang in there! You've been given this challenge, because you're capable. YOU ARE EXACTLY WHAT YOUR CHILDREN NEED! I am a huge advocate of counseling and think every human being should see a therapist at least (repeat: at least!) once in their lives. This will be refreshing, rejuvenating and uplifting for you. Thank you for being an example of honesty and love for the rest of us. You are dearly loved by many... especially from a mom who has a boy who is exceptionally challenging... exceptionally special at times. We are want to feel like we are "perfect mommies" and just loving mommyhood all the time...BS! Those moms are really robots. We all have moments whether they are hours, days, weeks or even months, where things just aren't going right. Thank you so much for sharing. It helps to start to take the stigma away from the "unperfect" moms. Kudos to you for seeking help from a counselor. Stigma-Schtigma...sometimes you just need a fresh voice and a fresh and objective perspective. Jen, you have always been one of the wisest and strongest people I know. I so admire you for your tireless pursuit of doing the absolute best for those kiddos. It may be difficult now, but your efforts will NOT be in vain. I believe that God is doing incredible things through your family - all five of you. You are all in my prayers. I'm Brazenlilly and I love Jesus. I blog whenever I feel like it about whatever random thoughts have crossed my mind--usually the adventures of motherhood and adoption, and things that make me laugh. I love candy. I value authenticity and sarcasm. Yes, I realize that sounds contradictory, but in my world they can be friends. My wonderful family drives me absolutely crazy, and I couldn't live one day without them. Wanna be my blog friend?